• Use the Religious Directories as a guide to find and invite representatives from other religions to join your next meeting as a strategic partner. In your letter of invitation, describe the Interfaith Celebration for A Season of Interfaith Celebration in your own words. 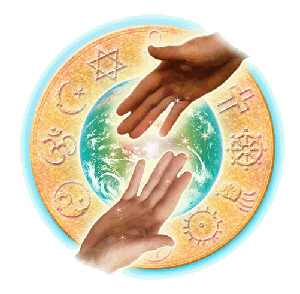 The Religions Directories will also steer you toward a mailing and contact list to invite the broader multi-faith community to your interfaith events. • Host a meeting at your church, or other agreed upon venue, with your New Thought colleagues and representatives from other religious traditions. If they feel called to invite key members of their communities this is a good sign and should be encouraged. • Make room for everyone to play, and share leadership! Our first task is to model new leadership and collaborative, non-hierarchical principles, including the power of collective wisdom based on spiritual foundations, shared vision, affirmation and empowerment. • Host leaders and members from other local faiths. Begin the meeting by asking if other faith leaders there would share a blessing, prayer or invocation with the group. • Make a basic presentation about the Season of Interfaith Celebration and then create an interactive dialogue. New Thought churches and spiritual centers are well aligned to create an interfaith vigil for global healing to which you can invite your community. Make contact with your peers representing different religious traditions and share with them all the opportunities for connection and dialogue coming together at this important time. There is probably an Interfaith Council in your city; invite its members to engage in the planning and co-sponsor your events. There are four Sundays in September—all dates would be the perfect to schedule meditation services and sacred sharing. The International Day of Peace takes place on Sunday, September 21. Services and meditations is a great opportunity to sponsor citywide events in your church. It is the right and privilege of your Interfaith Council to offer invocational prayer at City Council Meetings. Meet with your City Council leaders and ask them for an invitation to serve the Council by setting the tone for the meeting and recognizing the presence of a Sacred Power known by many names. Let them know that your interfaith group represents diverse faiths and religious beliefs (as well as non-religious) in your community and respects that we all live side by side in harmony with one another. During this Season for Interfaith Intercultural celebration, AGNT has made it possible for you to conduct a FREE 9-Week self-study and dialogue course based on the edited recordings of conversations with 18 of the foremost religious and spiritual teachers on the planet. The interviews are co-hosted by Jim Kenney, former Global Director of the Parliament of the World’s Religions and an expert in world religion and culture. The course is designed for weekly individual study followed by a local group dialogue. Any leader can facilitate the course with materials provided here, and the course can be tailored to New Thought groups meeting in churches, community interfaith councils, living rooms discussions, or educational settings. From Peace Day’s first minute in Auckland, New Zealand until its last minute in Honolulu Hawaii, people around the globe will be able to enjoy PEACECAST 2014: 48 hours of music, video, film, documentary, poetry, dance, visual arts and individual expressions, all celebrating people’s appreciation and desire for peace. PeaceCast 2014 includes entries submitted from all over the world. The webcast will be available at http://www.peacecast.tv as long as it is Peace Day anywhere on the planet. Kids for Peace has a peace pledge you can download. "I pledge to use my words to speak in a kind way. Jane Goodall Roots & Shoots chapters flew giant peace doves in 22 countries and 69 cities in 2005 to inspire their communities for the International Day of Peace. Bring the giant doves of peace to your Peace Day celebration. Download a PDF to make your own giant peace dove. You can help to create a more peaceful world. Ask your Mayor, City Council, Governor and Head of State to declare a legal holiday on September 21, the International Day of Peace. Which nation will be the first to declare Peace Day as a National Holiday.Contact heads of state in all nations by contacting their ambassadors to the Permanent Missions at the United Nations. Request that they officially become advocates for a nonviolent solution. See United Nations Resolution below. Thank you for considering to officially state your nation’s support of UN General Assembly Resolution A/RES/55/282 fixing the date for the International Day of Peace as 21 September and declaring “that the International Day of Peace shall henceforth be observed as a day of global ceasefire and non-violence, an invitation to all nations and people to honour a cessation of hostilities for the duration of the Day..."
For the past 24 years, the International Day of Peace has been a catalyzing opportunity for individuals, nations and civil society to unite in our shared yearning for a more peaceful, just and sustainable world. Thousands of events and activities have taken place for the International Day of Peace, coordinated by governments, agencies and a network of more than 800 civil society organizations in over 106 nations! The issue of peace has never been more relevant, but the truth is that most people around the world do not know about the International Day of Peace. Global awareness about the Day will help to convince individuals and nations that we share a common wish for peace, and this year’s Peace Day can play a significant role in helping to increase global cooperation to strive towards this most worthy of goals. Your nation can help lead the way to a more peaceful world by leading the call for the International Day of Peace. Please consider being one of the first nations to do one or more of the following: 1) pledge to honor the United Nations’ call for a Global Ceasefire on 21 September; 2) establish a National Holiday on 21 September for the International Day of Peace; 3) Convene a national Minute of Silence at Noon on the International Day of Peace. Please consider this opportunity for your nation to lead the world towards peace. The Republic of ________ supports UN General Assembly Resolution A/RES/55/282 for the International Day of Peace. __ Our nation pledges that unless attacked we will honor the UN’s call for a Global Ceasefire on 21 September. __ Our nation will establish a National Holiday on 21 September for the International Day of Peace. __ Our nation will participate in the Minute of Silence at Noon on the International Day of Peace.